Phospholipase C-related catalytically inactive proteins (PRIP-1/2) are previously reported to be involved in the membrane trafficking of GABAA receptor (GABAAR) and the regulation of intracellular Ca2+ stores. GABAAR-mediated currents can be regulated by the intracellular Ca2+. However, in PRIP-1/2 double-knockout (PRIP-DKO) mice, it remains unclear whether the kinetic properties of GABAARs are modulated by the altered regulation of intracellular Ca2+ stores. Here, we investigated whether GABAAR currents (IGABA) evoked by GABA puff in layer 3 (L3) pyramidal cells (PCs) of the barrel cortex are altered in PRIP-DKO mice. The deletion of PRIP-1/2 enhanced the desensitization of IGABA but induced a hump-like tail current (tail-I) at the GABA puff offset. IGABA and the hump-like tail-I were suppressed by GABAAR antagonists. The enhanced desensitization of IGABA and the hump-like tail-I in PRIP-DKO PCs were mediated by increases in the intracellular Ca2+ concentration and were largely abolished by a calcineurin inhibitor and ruthenium red. Calcium imaging revealed that Ca2+-induced Ca2+ release (CICR) and subsequent store-operated Ca2+ entry (SOCE) are more potent in PRIP-DKO PCs than in wild-type PCs. A mathematical model revealed that a slowdown of GABA-unbinding rate and an acceleration of fast desensitization rate by enhancing its GABA concentration dependency are involved in the generation of hump-like tail-Is. 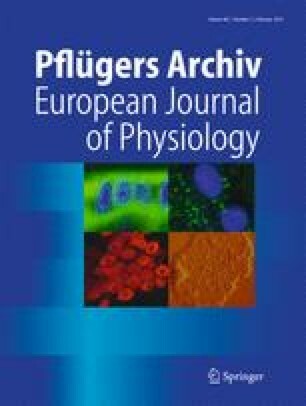 These results suggest that in L3 PCs of the barrel cortex in PRIP-DKO mice, the increased calcineurin activity due to the potentiated CICR and SOCE enhances the desensitization of GABAARs and slows the GABA-unbinding rate, resulting in their unusual resensitization following removal of GABA. The authors thank Dr. N. Akaike for critically reviewing an earlier version of the manuscript. This study was supported by a Grant-in-Aid for Scientific Research to Y.K. (B; 22300127) and that to M.H. (S; 24229009) from Japan Ministry of Education, Culture, Sports, Science and Technology.